A Native of Texas, Jason has lived in the Fort Bend Independent School District for the past nine years. He and his wife, Andrea, have built a family here together providing for their two children Blake, and Makalya. 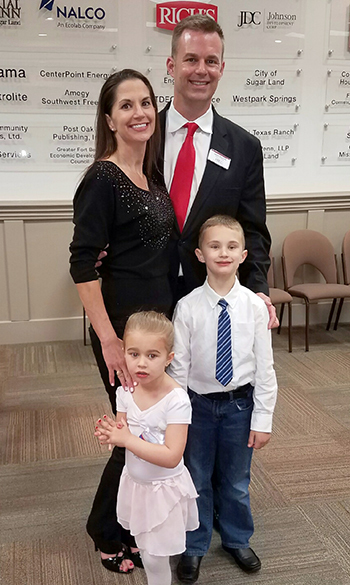 As parents of a Fort Bend ISD student, Jason has expressed the desire to commit more of his time working alongside the local community to help secure the American Dream for all of the children in FBISD. Jason is a graduate of Texas A&M University, where he received his Bachelor of Science in Education. In seeking other ways to impact the lives of his fellow citizens, Jason got into the financial services industry where he educates his clients about future and fiscal planning so that they are able to meet their life-long goal of financial stability. In his field, Jason has had the opportunity to provide guidance and counsel to many teachers at every stage in their careers. As a passionate educator, mentor, and servant leader, Jason is always seeking to serve others for the sole purpose of positively impacting the community to which he is vested. These traits have been demonstrated through his years of volunteerism and civic duty. Jason has volunteered, and mentored at-risk youths in the local district through a program known as: H.O.S.T.S. (Helping Students To Succeed). For over the past ten years Jason has volunteered weekly at M.D. Anderson Cancer Center, making patients and their loved ones comfortable during their treatment and stay. In FBISD, Jason has demonstrated his commitment to volunteerism and civic duty by serving on the District's Steering Committee, as well as the Ridgemont Elementary and Early Childhood Center Campus Based-Leadership Team. He currently serves as vice-president of the board of trustees and is enrolled in the class of 2017 Fort Bend Chamber of Commerce Leadership Forum.